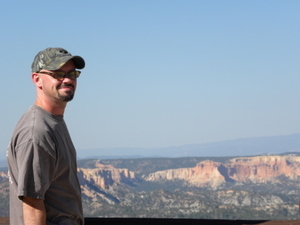 Michael Hios at Bryce Canyon doing what he loves. Many years ago, I was told by a successful musician (who was paraphrasing, of course), “Do what you love and you’ll never work a day in your life.” I took those words as gospel and tried very hard to turn my passion into work. I love music. It’s a significant thread in the fabric of my life. My father is a musician. His father was a musician, so you could say that it’s in my blood. There was a time in my life when I strove to be a professional musician. It was a very fun, rewarding, and frustrating time in my life, during which I learned many valuable lessons. The most valuable knowledge I gained during that period is that there’s no more efficient way to kill the passion for something than to make work of it. From a macro perspective, with my hard-earned experience, it’s easy to see how that famous musician felt the way he did. He was talented and lucky enough to have the success (and thus, the finances) to pay people to do all the things that are necessary for a stage performer to work. He didn’t have to pack up and transport his gear. He didn’t have to maintain, repair, tune and tweak his equipment. He had a Manager to handle all of the business aspects of his work. That’s not to say that he never did any of these things. He reached a point of success that his rewards helped him to leave behind and forget the pain of these necessities. What are the chances of becoming so successful? This is not a cautionary tale, warning against the futility of chasing dreams. Every person should pursue the things in life that bring them joy. If you can become successful enough at it to make a living of it, you are very fortunate. At some point, most of us will realize that while we derive happiness from those activities, they rarely provide us with the financial resources to allow us the freedom to live off them. When that epiphany comes, don’t be discouraged. Instead of “doing what you love,” flip the adage on it’s head. While it may not be possible to do what you love for a living, there are things you can do to make your work fulfilling. According to the Society for Human Resource Management, employee engagement is a critical component of overall workplace satisfaction. When we are “engaged” in our work, we are far more likely to be happy with our jobs. According to the SHRM 2012 Employee Job Satisfaction and Engagement Survey, the #1 aspect most important to employee job satisfaction is “Opportunities to use skills/abilities.” This job component ranked 2 points higher than compensation and 1 point higher than job security in their survey. Content employees realize that it’s important to feel like they are utilizing their personal assets to contribute to the mission of the organization. If work was always fun, it would not have been called “work,” it would have been called “fun.” Performing a job that you don’t love is easy when you’re surrounded by good people. If you work in a place where you feel connected to your co-workers, your days can seem much shorter. Considering the fact that full-time workers spend most of their waking moments with co-workers, it’s easy to see the benefits of bonding with them. Here’s a good example of someone who loves where she works (HootSuite) and a good tip on using technology in your job search. If you’re lucky and good enough to do what you love, you deserve the happiness and fulfillment that comes with that. If not, you can still make your days enjoyable and fulfilling by loving the things that you do. This entry was posted in Business, Life and tagged Business, Employment, Job satisfaction, Society for Human Resource Management. Bookmark the permalink.